A healthy girl is a happy girl! A girls guide to eating healthy should include a varied and balanced diet. For many girls, healthy eating simply isn't a priority. This is where the guidance of the adults in a girl's life is so very important. Unfortunately, today's society focuses on the ideal body image. This puts a lot of pressure on girls to maintain what the media often portrays as the perfect figure. For many girls, the need to look good completely overshadows a focus on healthy eating. Eating disorders have become a very real health risk for many girls, and while anyone can have an eating disorder, anorexia and bulimia are most often found in girls. While we tend to lay the blame of unhealthy eating at the feet of television and magazines, peer pressure and even parental pressure sometimes play a role in how a girl feels about her body. Peer pressure is easy to understand. Teens, preteens, and even young adults often base their decisions about themselves and their lives on what their peers deem important. Because of this, healthy eating may take a back seat to maintaining that perfect body weight at any and all costs. Parents sometimes contribute to this negative way of thinking as well, however. Each time a parent points out to a girl that her clothes have gotten too tight or she doesn't need that extra cookie, he or she may unwittingly be sending a message that the girl is too heavy. Eating disorders are among the top four leading causes of burden of disease in terms of life lost through disability or death. Up to 10 percent of women with anorexia nervosa may die due to anorexia-related causes. Risk of death among individuals with anorexia is 12 times greater than their same age peers without anorexia. Health consequences such as osteoporosis (brittle bones), gastrointestinal complications and dental problems are significant health and financial burdens throughout life. Between 0.3 to 1 percent of young women have anorexia nervosa, which makes anorexia as common as autism. Around 1 to 3 percent of young women have bulimia nervosa. This site also quotes statistics from the book ''Body Wars: Making Peace with Women's Bodies" by Dr. Margo Maine. 42 percent of 1st through 3rd grade girls want to be thinner. 51 percent of 9 to 10 year old girls feel better about themselves when dieting. 53 percent of 13 year old girls are unhappy with their bodies. 78 percent of 18 year old girls are unhappy with their bodies. The number one wish of girls 11 to 17 years old is to lose weight. Regular meals-Your family is active and on the go. You often feel that getting everyone to sit down and eat together is a major accomplishment. While your schedules may pull all of you in several different directions, it is very important to eat regular meals during the day…every day. Shoot for three well-balanced meals and two healthy snacks. 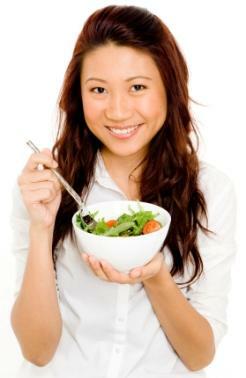 Balanced Diet-A girl's development depends upon a well-balanced diet. This means lots of fresh fruits and vegetables, whole grains, proteins, dairy foods, and healthy fats. Portion Control-A very important aspect that should be a part of every girls guide to healthy eating, regardless of her weight, is portion control. Teach your girl to stop eating when she is full. It's okay to leave extra food on that plate! Cooking Options-Fried is fast, right? Sure, fast food icons have turned the world on to fried foods. However, there are much healthier alternatives, such as grilled, baked, and even stir-fried. Seasoning Choices-Food just tastes better with lots of butter and salt…or does it? Skip the bad fat grams and the high sodium content, and instead choose herbs to spice up your dinner. Sugar Alternatives-Does your little sweetie have a sweet tooth? Help her combat it by offering better alternatives, such as sugar-free drinks and snacks and flavored water. Finally, as with any health issue, if you have concerns about your girl's eating habits and health, speak with her doctor as soon as possible. Nothing is more important that your girl's health!